A popular science article on Indo-European migrations has appeared at Science News, entitled How Asian nomadic herders built new Bronze Age cultures, signed by Bruce Bower. While the article is well-balanced and introduces new readers to the current status quo of the controversy on Indo-European migrations – including the opposing theories led by Kristiansen/Anthony vs. Heyd – , it reverberates yet again the conclusions of the 2015 Nature articles on the subject, especially with its featured image. 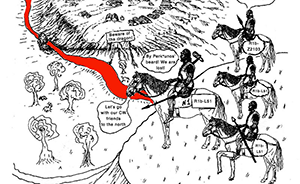 I have argued many times why the recent ‘Yamnaya -> Corded Ware -> Bell Beaker’ migration model is wrong, mainly within my essay Indo-European demic diffusion model, but also in articles of this blog, most recently in the post Correlation does not mean causation: the damage of the ‘Yamnaya ancestral component’, and the ‘Future America’ hypothesis). It is known that Nature is a bit of a ‘tabloid’ in the publishing industry, and these 2015 articles offered simplistic conclusions based on a wrong assessment of archaeological and linguistic data, in search for groundbreaking conclusions. Corded Ware culture emerged as a hybrid way of life that included crop cultivation, breeding of farm animals and some hunting and gathering, Kristiansen argues. Communal living structures and group graves of earlier European farmers were replaced by smaller structures suitable for families and single graves covered by earthen mounds. 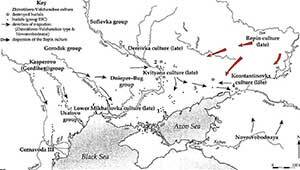 Yamnaya families had lived out of their wagons even before trekking to Europe. 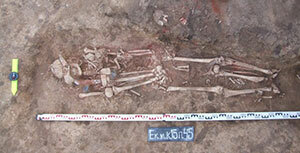 A shared emphasis on family life and burying the dead individually indicates that members of the Yamnaya and Corded Ware cultures kept possessions among close relatives, in Kristiansen’s view. “The Yamnaya and the Corded Ware culture were unified by a new idea of transmitting property between related individuals and families,” Kristiansen says. 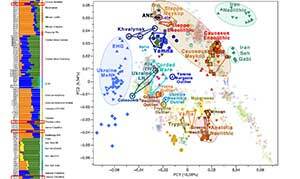 Yamnaya migrants must have spoken a fledgling version of Indo-European languages that later spread across Europe and parts of Asia, Kristiansen’s group contends. Anthony, a longtime Kristiansen collaborator, agrees. 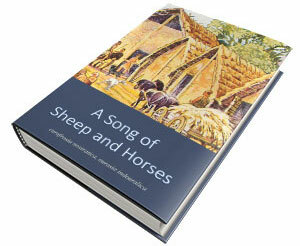 Reconstructed vocabularies for people of the Corded Ware culture include words related to wagons, wheels and horse breeding that could have come only from the Yamnaya, Anthony says. I have already talked about Kristiansen’s continuation of Gimbutas’ outdated ideas: we are seeing a renewed effort by some Scandinavian (mainly Danish) scholars to boost (and somehow capitalise) the revitalised concept of the “Kurgan people”, although now the fundamental issue has been more clearly shifted to the language spoken by Corded Ware migrants. As far as I can tell, this renewed interest began two years ago, with the simultaneous publication of genetic studies by Haak et al. (2015), and Allentoft et al. (2015), and the misuse of the cursed concept of ‘Yamnaya ancestry‘ to derive far-fetched conclusions. On the other hand, genetic research is not solely responsible for this: David Anthony – who was apparently consulted by Haak et al. (2015) for their paper, where he appears as co-author – has kept a low (or lower) profile, and only recently has he merely suggested potential links between Corded Ware and Bell Beaker cultures in Lesser Poland, that might explain what (some geneticists have told him) appeared as a potential Yamna -> Corded Ware -> Bell Beaker migration in the first ancient samples studied. Anthony’s migration model remains otherwise strongly based on Archaeology, offering a careful interpretation of potential contacts and migrations in the Pontic-Caspian steppe, and only marginally offers some views on Linguistics (based on Ringe’s controversial ‘glottochronological model’ of 2006), to the extent that he is compelled to explain the potential adoption of Indo-European by Corded Ware culture (CWC) peoples as multiple cultural diffusion events, since no migration is observed from the steppe to CWC territories. I think he is thus showing a great deal of restraint, not jumping on the bandwagon of this recent trend based on scarce genetic finds – and therefore losing also the opportunity to publish articles in journals of high impact factor…. This newly created Danish school, on the other hand, seems to be swimming with the tide. Kristiansen, known for his controversial ‘universal’ interpretations of European Prehistory – which are nevertheless more readable and interesting than most specialised literature on Archaeology, at least for us non-archaeologists – , has apparently seized the opportunity to give a strong impulse to his theories. I see therefore three main “branches” of this support (two of them, Genetics and Linguistics, only recently giving some limited air to this dying hypothesis), with a closely related group of people involved in this model, and they are lending continuous support to each other, by repeating the same theory – and repeating the same misleading map images (like the one shown in the article) – , so that the circular reasoning they represent is concealed behind seemingly independent works. The main theory is officially rooted then in Kristiansen’s hypothesis, whose first article on the subject seems to be Prehistoric Migrations – the Case of the Single Grave and Corded Ware Cultures (1989), supporting the Kurgan model applied to the Corded Ware migrations. It was probably a kind of a breakthrough in Archaeology, bringing migration to mainstream Archaeology again (followed closely by Anthony), and he deserves merit for this. After this proposal, there are mostly just his publications supporting this model. Nevertheless, Kristiansen’s model, I gather, did not involve the sudden Yamnaya -> Corded Ware migrations discussed in recent genetic articles, but long-lasting contacts between peoples and cultures from the North Pontic steppe, Trypillian, and Globular Amphora, that formed a new mixed one, the Corded Ware people and culture. 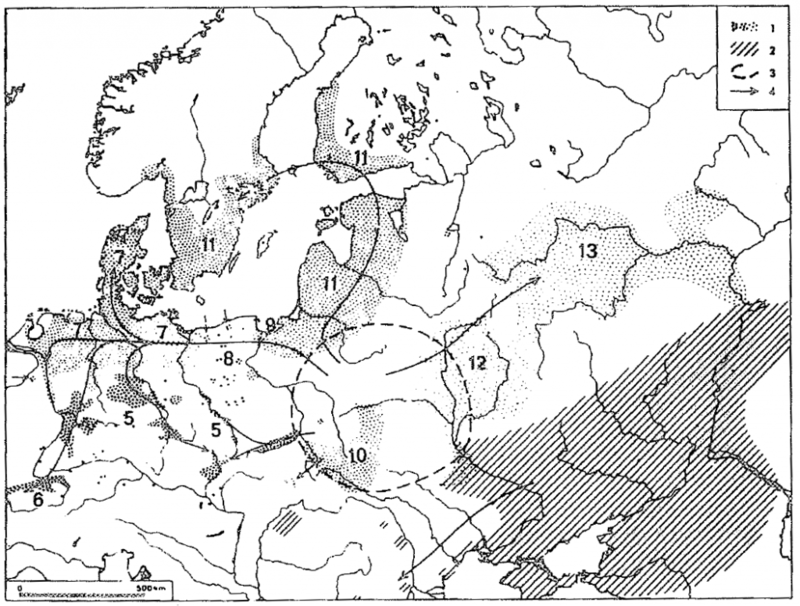 Also, in Gimbutas’ original model of migration (1963), waves of Kurgan migrants are also described into Vučedol and Bell Beaker, which have been apparently forgotten in recent models*. 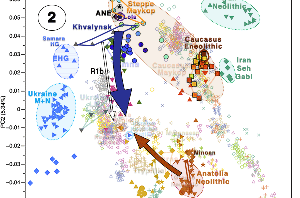 * The most recent model by Anthony describes such migrations into Early Bronze Age Balkan cultures – as do most archaeological publications today – , but he is unable to recognize migration waves from Yamna into the Corded Ware culture, and because of that describes mere potential routes (or modes) of cultural diffusion including language change. Proposal for the origin and spread of the Corded Ware/ Battle Axe cultural complex: 1) Distribution of CWC groups; 2) Yamna culture; 3) presumed area of origin; 4) presumed main directions of the primary distribution. Also numbered are other individual CW cultures. From Kristiansen (1989). Detail of Fig. 1 from Allentoft et al. 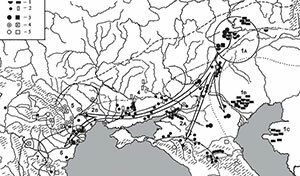 (2015): “Distribution of Early Bronze Age cultures Yamnaya, Corded Ware, and Afanasievo with arrows showing the Yamnaya expansions”. Recent publications by K-G Sjögren – from the same department as Kristiansen, at the University of Gothenburg – seem to imply that there was a direct connection Corded Ware -> Bell Beaker in central Europe. Modified from Kristiansen et al. (2017). 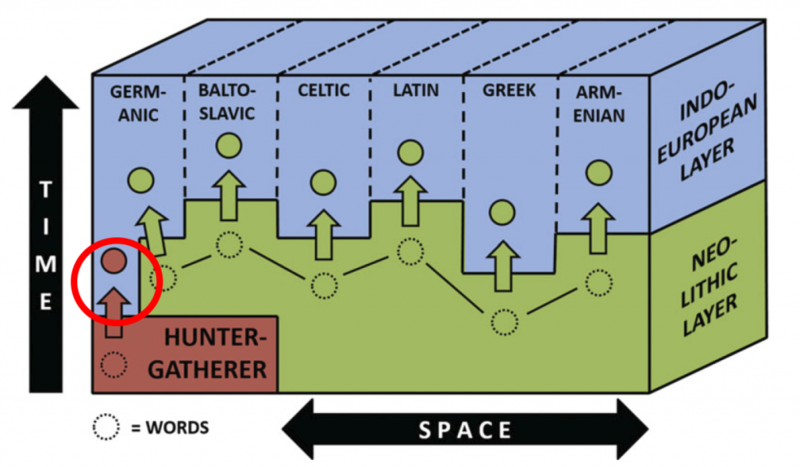 “Schematic representation of how different Indo-European branches have absorbed words (circles) from a lost Neolithic language or language group (dark fill) in the reconstructed European linguistic setting of the third millennium BC, possibly involving one or more hunter gatherer languages (light fill) (after Kroonen & Iversen 2017)”. 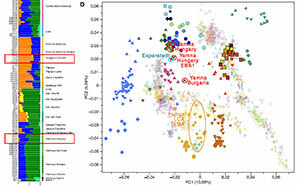 of the identification in the 2000s of the modern distribution of Y-DNA haplogroup R1a and Corded Ware as the vector of Indo-European diffusion in Europe – and thus also the desire of many in northern and eastern Europe to identify with this ancient culture. Publications are always great to advance in knowledge, and if they bring some deal of publicity, and more publications (with the always craved impact factor), and maybe more investment in the departments (with more local jobs and prestige)… why not? 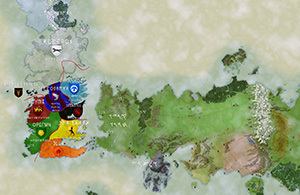 However, this model of workgroup research system is reminiscent of the Anatolian homeland group loosely created around Renfrew; the Palaeolithic Continuity workgroup around Cavalli-Sforza; or (more recently) the Celtic from the West group around Cunliffe and Koch. The difference between Kristiansen’s workgroup and supporters of all those other models, in my opinion, is that (at least for the moment) their collaboration is not obvious to many. Therefore, to be fair with any outsider, I think this group should clearly state their end model: I propose the general term “Indo-European Corded Ware Theory” (IECWT) workgroup, because ‘Danish’ is too narrow, and ‘Scandinavian’ too broad to represent the whole group. But any name will do. 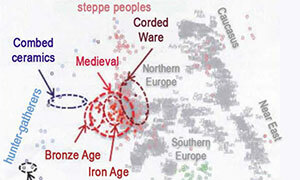 Not for a unified Pre-Germanic community before the Dagger Period, and still less linked with the expansion of the Corded Ware culture from the steppe – that connection is found only in Anthony (2007), where he links it with a cultural diffusion into Usatovo, which seems too late for a linguistic expansion with Corded Ware peoples, with the current genetic data. The wrong interpretation of scarce initial ancient samples has been another feeble stone put over the ruins of Gimbutas’ theory. While her simple theory of Kurgan invaders was certainly a breakthrough in her time – when speaking about migrating Indo-European peoples was taboo -, it has since been overcome by more detailed archaeological and linguistic accounts of what happened in east and central Europe during the Chalcolithic and Bronze Age. However, a lot of people are willing to consume post-truth genetic-based citebait like crazy, in a time when Twitter, Facebook, blogs, etc. seem to shape the general knowledge, while dozens of new, carefully prepared papers on Archaeology and Linguistics related to Indo-European peoples get published weekly and don’t attract any attention, just because they do not support these simplistic claims, or precisely because they fully reject them. One is left to wonder whether the support of Corded Ware + haplogroup R1a representing Pre-Germanic is also in line with the most natural human Kossinnian trends, whereby the older your paternal line and your ancestral language are connected to your historical territory, the better. The lack of researchers from Norway – where R1b subclades brought by Bell Beakers peak – in the workgroup is revealing. Just as we are seeing strong popular pressure e.g. to support the Out of India Theory by Hindu nationalists, or some Slavic people supporting to recreate a ‘Northern IE group’ with a Germano-Balto-Slavic Corded Ware culture – and a renewed interest in skin, hair and eye colour by amateur geneticists – , it is only natural to expect similar autochtonous-first trends in certain regions of the Germanic-speaking community. NOTE: I feel a bit like an anti-IECWT hooligan here, and once again fulfilling Godwin’s Law. Judging by previous reactions in this blog to criticism of the Out of India Theory, and to criticism of R1a as the vector of expansion of Indo-European languages, this post is likely to cause some people to feel bad. It is not intended to be against these researchers individually, though. All of them have certainly contributed in great ways to their fields, indeed more than I have to any field: Kristiansen is well-known for his careful, global interpretations of European prehistory (and has been supporting his model for quite a long time). I do like Kroonen’s ideas of a Pre-Germanic substratum. And people involved in the group do so probably because they collaborate closely with each other, and because of the huge pressure to publish in journals of high impact factor, so to mix their disparate research within a common model seems only natural. 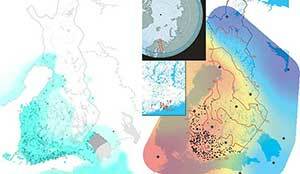 But their collaboration is boosting certain wrong ideas, and is giving way to certain misconceptions in Linguistics, and also sadly renewed past ethnocentric views of language in Northern Europe – that will be luckily demonstrated, again, wrong. After all, publications (like ideas in general) are subjected to criticism, as mine are. Researchers who publish know their work is subjected to criticism, and not only before publication, but also – and probably more so – after it. That a paper can be incorrect, biased, or even completely absurd, does not mean the person who wrote it is a fool. That’s the difference between criticising ideas and insulting. If criticism offends you, you shouldn’t be publishing. Period. Featured image: From Allentoft et al. (2015)“>Allentoft et al. (2015). See here for full caption.